Your teacher website is open to the public and was designed to help you establish a personal and instructional image. The content of your private Courses and Classs content published in School Loop is separate from your public website. If you haven't had a chance to review the Easy Start Guide for teachers, please use the links in the left column to download a copy for your version of School Loop. You'll find these help pages for teacher websites much easier to follow if you've been through the guide. To access your personal site, use the My Website icon locate top center of every page in your portal. A teacher website starts off with a single page waiting to be fleshed out before publishing. Click the Properties button next to the page title to change the name or template of the page. You'll also have the option to enter a URL name to make it easier for visitors to find your site. Enter "kjones" if you want the URL name to be yourschool.schoolloop.com/kjones. Note: URL names must be unique within a school site, so avoid using a name that others may be using. If you'd like to change the layout, you may do so. We recommend, however, that you initially stick with the default three column template with navigation in the left column. The Preview Draft button opens a new window or tab to show how the page will look on the live site. After publishing the page, the label "Page Never Published" will be replaced with a Live View button. This button allows you to compare your draft with the current live version of the page. The Activity button includes a list of open drafts and recently published pages. You'll also find a button for publishing and unpublishing your site. The Resource Files button takes you to your image albums and locker. Rights allows you to grant editor and contributor rights to other users. Use the Add menu to create new pages or mini-sites (folders). 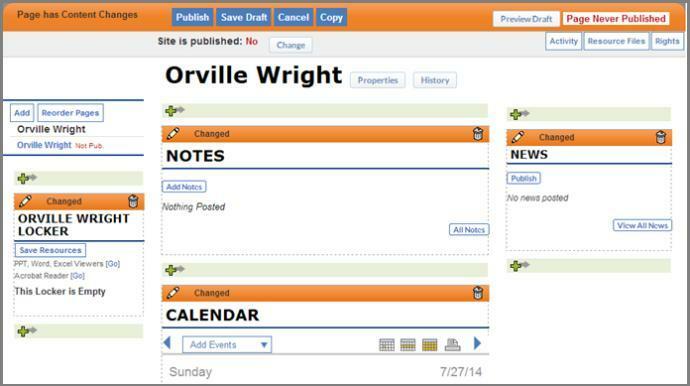 The Reorder Pages button allows you to customize the order of the pages as well as move pages in or out of mini-sites. Additionally there's a button for undeleting pages and a link for the History of the pages on your teacher site. This button is located to the right of the page name. You can use the History button to view, edit and republish older versions of a page. The default page contains a number of elements (types of content). Any element you do not wish to keep may be removed by clicking the trash can icon for that element. If you delete an element and later change your mind, there's no need to worry. It's a snap to add more elements. Just click the the green + sign anywhere on the page that you want to add an element. Share files and links on your site using the Locker Element. You can upload resources using the Save Resources button on the locker element, but there are other ways to manage the contents of all your lockers including your teacher website locker. This element allows you to post notes for your site. Think of it as a blog. To add a note, click the Add Notes button the the Notes Element. It is possible to publish a note with a date set in the future. Doing so will make the note inaccessible until it's publish date arrives. By default the 10 most recent notes will appear on the page with the newest on top. A View All Notes link will appear on the bottom of the list if there are more than 10 notes. To change the default settings, click the pencil icon for the notes element. All notes remain on your site until you delete them. The calendar will display all the events you publish to your personal website. Click the pencil icon if you'd rather have a day or week calendar. There are 5 calendar options along with an editable title. Use the Add Events menu on the calendar to publish an event to your teacher website calendar. Publish important news by clicking the Add News button on the element and filling out the simple form. The newest items appear on the top of the list. Expired posts drop off automatically. Clicking the pencil icon allows you to choose how many news items will appear on the page and the format of the news ("Short" lists the headline only. "Long" displays the headline and up to the first few lines of text). So, you've deleted some elements from your default teacher page and added content to others. Perhaps you've also posted some news, events, and notes. Are you ready to publish your site? Well, that's up to you. If you'd like to embellish the site in any way before opening it up to the public, then continue reading the other pages of this section. When you are ready, just click the Change button near the top of the page where the state of your site is clearly displayed. If you wish to unpublish your site, simply click the Change button again. If your school has included you in a directory on the school site, your name in the directory becomes a link to your site as soon as you publish.